For Under the Radar's 16th Annual Artist Survey we emailed some of our favorite artists a few questions relating to the last year, plus some fun personal questions. We asked them about their favorite albums of the year and their thoughts on various notable 2018 news stories involving either the music industry or world events, as well as some quirkier personal questions. Here are some answers from Bernice. Bernice is a 5-piece from Toronto. 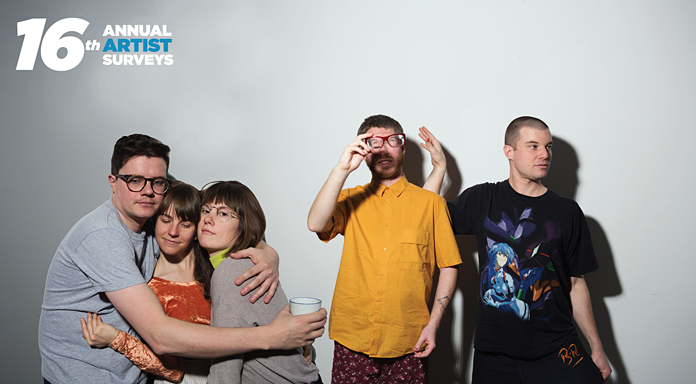 Their latest album, Puff LP: In the air without a shape, came out last May via Arts & Crafts. Full Band: Not in order of preference. Robin Dann: I think change takes such a long time, and it's impossible for me to measure progress accurately from the inside. In my life, I work mostly with men, and also with some women, all pretty wonderful people. It's too bad that it's pretty imbalanced, from a gender standpoint. I'm lucky that I haven't been a victim of assault, but I feel how my experience as a woman making music is subtly different from the men around me, in a lot of ways, and that can be confusing. So, basically, I don't know! Dan Fortin: You mean The Hobbit? I'm like Sam Gamgee cause he's always hungry, and complaining. Although I actually don't remember if that's true, I might be making that up. Thom Gill: Also, he's the most loyal friend! Full Band: Thom is a mix between Rowlf the piano playing dog and the Hecklers. Phil is Beaker! Robin is Mokey the Fraggle. Dan is actually the Swedish Chef. Felicity is Kira from Dark Crystal who speaks all the languages of all the plants and animals in nature. Full Band: We're lucky to live in Canada where some mental health resources that are available are subsidized by the government. It's so important to reduce shame and stigma around mental health so that people feel comfortable seeking help. This is definitely starting to happen in our community, but it still takes a lot of effort to seek help. There just really needs to be more visibility and more availability for those subsidized services we have access to. Are you ready for artificial intelligence and a more automated future? Phil Melanson: I love the fashion in the original Blade Runner. Also, I'm really looking forward to self-driving cars. Full Band: Dan was playing in Paris on November 13th, 2015 and was locked into his venue for several hours during the terrorist attack. Phil was playing in Mumbai in 2008 during the bombings and was staying in the Taj Mahal 2 Hotel. The terrorists targeted the Taj Mahal 1. Thom's most surreal experience was making out with an on-duty cop while on tour in Stockholm. Full Band: Dan and his partner Zazu actually made the crazy pumpkin dish from the Lyon, France episode and it was so rich they could barely eat it. It was a pumpkin stuffed with bread, Gruyere, and cream. Full Band: The president of the United States of America! Santa Claus! Full Band: Cell phones. Taking anything seriously. Bad kissing. Dan: I was in high school and my high school girlfriend and I went out for Valentine's Day, and she got food poisoning, and Feb 15th was her birthday. I felt pretty bad about that one. Full Band: Bernice's most disastrous date: a one word each story: Once I went to Chuck E. Cheese's with dad and mom. Only when we arrived, overly enthusiastic farm hands started barking wildly because Toodles the clown nipped my toe delicately and fondled my mind. We fled the restaurant and went back to reality, aka Thee Olive Garden.